DIRECTOR José Miguel Linares EDITORIAL BOARD Alfredo Araújo Amílcar Valencia Diana Tabares Enrique Álvarez Margarita Saade Pablo Urrutia Paulo González Carolina Riaño EDITORIAL ASSISTANCE Mediática Comunicaciones PHOTOS Good;) Comunicaciones Drummond Ltd. Colombia DRAFTING, EDITING AND PUBLISHING Good;) Revista Drummond is a publication edited by Drummond Ltd. Colombia. 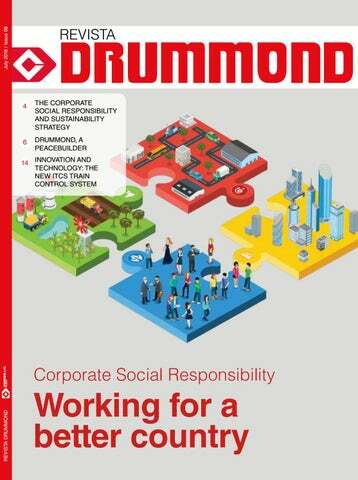 MAIN TOPIC The corporate social responsibility and sustainability strategy Sustainability is an essential aspect of Drummond’s work. More than a business area, it is a cross-cutting aspect of all of the organization’s processes. Towards better management Aligned with CSR strategy. Working for a Better Country This is the impact of our CSR activities. ‘Well Done Mining’ A contribution to the industry’s development. Innovation and technology The new ITCS Train Control System. Engaging in dialogue to create a better company This contact has strengthened labor relations at Drummond. First of all, I give thanks to God Every time I attend a safety talk, I usually share them with my wife and kids. its workforce on the Voluntary Principles on Security and Human Rights and the United Nations Guiding Principles on Human Rights and Business. For all of the above to have the greatest impact, the four pillars of our strategy must be synchronized and work with the same intensity. This is why we are constantly working to ensure that the leaders in our area of influence have the knowledge and tools that allow them to govern efficiently and effectively, leading to diversified and sustainable economic development. The ideal is for them to take advantage of the resources that the mining sector generates every day, not just in terms of royalties and taxes, but also in the vitality that goes hand in hand with the economic activity from Drummond’s more than 9,000 direct and indirect employees, not including those from other mining companies. This development and expanded income options become generators of well-being, allowing people to improve their quality of life. Today, Drummond is in a position of great importance and responsibility as the country’s largest coal producer and exporter in 2017, generating significant resources for development. For this reason, along with responsible and sustainable environmental achievements, Drummond is focusing its efforts and social policies on generating well being and development. We are a company that is truly contributing to help a country like Colombia heal its wounds, achieve true reconciliation and look toward the future. The corporate social responsibility and sustainability strategy “This strategy is the result of several dialogue sessions with the departments involved, based on the results of a socio-economic study of the population in the area of influence of the operations in Cesar and Magdalena and an analysis of stakeholder perceptions and expectations. It has been a task in which everyone has participated.” Juan Pablo Arteaga, Drummond’s Corporate Social Responsibility manager. ustainability is an essential aspect of Drummond’s work. More than a business area, it is a cross-cutting aspect of all of the organization’s processes. For this reason, the Corporate Social Responsibility – CSR strategy seeks to coordinate the company’s existing efforts in the communities, environmental management, supply chain and employee welfare in order to increase its positive social impact and improve its brand, reputation, customer relationships and profitability. challenges that will come in the future and to report on its contribution to society. “With this social responsibility strategy, we are seeking to generate conditions that allow us to continue to operate the mine in a sustainable manner. This is important because, around the world, society is increasingly demanding that companies show their commitment to their surroundings,” said Juan Pablo Arteaga, Drummond’s Corporate Social Responsibility manager. practices in the work done by companies in the coal industry) and thanks to this organization’s audits, Drummond has strengthened its strategic vision of sustainability. PEACE AND HUMAN RIGHTS Establishing capabilities in its area of influence to build a peaceful, just and tolerant society. In 2015 the UN adopted the Sustainable Development Goals (SDGs), a series of goals that seek to end poverty, protect the planet and ensure prosperity for all with the support of business and society. Drummond recognizes that corporations, along with governments and citizens, have a joint responsibility to achieve these goals, and for this reason it supports the three aspects of the goals (economic, social and environmental), incorporating them into its 2017-2019 strategy. “This strategy is the result of several dialogue sessions with the departments involved, based on the results of a socio-economic study of the population in the area of influence of the operations in Cesar and Magdalena and an analysis of stakeholder perceptions and expectations. It has been a task in which everyone has participated,” Arteaga added. Strengthening local institutional capacity for greater efficiency in public planning and management. ENVIRONMENTAL PERFORMANCE Increasing business capabilities that ensure world-class environmental performance. Strengthening local capabilities for the prosperity of its employees, their families and the communities in its area of influence. Through these pillars of sustainable management, Drummond plans to use its resources properly, implementing best management practices in all areas, showing that it is possible to mine responsibly within the framework of international standards and local regulations. Drummond Ltd. contributes to the social development of the surrounding communities and the creation of peaceful environments through various initiatives that it works on with the support of the Agency for Reincorporation and Normalization –ARN– (formally known as the Colombian Agency for Reintegration –ARN, in Spanish–) and the Office of the Mayor of Ciénaga. efore the agency changed its name, Drummond supported several of its projects. It previously worked on reintegration processes for PPR (People in the Process of Reintegration), so that they could complete the hours of social service needed to be able to access some of the benefits granted by the national government. “These people worked on projects painting child development centers in the area of influence of our operations, park restoration projects (such as the Simón Bolivar Park in Ciénaga) and on the construction of multi-use courts in the same municipality,” said Álvaro Daza, Drummond Ltd. Communities Coordinator. GOLOMBIAO, THE GAME OF PEACE Values such as equality, non-violence, freedom of expression, active participation, non-discrimination, caring for oneself and others, and taking care of the environment were the focus of the “Building values through play” strategy, a project led by the Agency for Reincorporation and Normalization (ARN), Drummond Ltd. and the Office of the Mayor of Ciénaga that seeks to bring young people closer to these principles through playing soccer. The project seeks to prevent young people from being victims of forced recruitment by illegal armed groups and has benefitted 540 students from five public schools in the town (El Cármen, Enoc Mendoza, La María, Alianza para el Progreso and Alfredo Correa de Andreis). The young people from these five schools participated in festive, artistic and recreational activities and learned about the importance of adopting these values in their daily lives. At the same time, soccer matches were held in an inter-grade championship. The young people learned about taking care of the environment by participating in reforestation activities with donated trees from Drummond’s port nursery and put the principles that they learned during the Golombiao game into practice by reading to young children and making recyclable cardboard cards generated by the operation of the Transportation Department. The final was played between the teams from El Cármen and Alianza para El Progreso. The hope is that this experience can be replicated in the future in other places, expanding the project’s coverage. La Haya fue una de las ciudades europeas que conocieron la labor de Drummond en Colombia. the Ministry of Foreign Affairs, the Bettercoal initiative, employee associations, and nongovernment organizations (NGOs), such as Pax. “Drummond was also invited by the Dutch Ministry of Foreign Affairs to participate in the panel on ‘Mining for prosperity – Responsible mining in fragile areas’ to present our social responsibility initiatives focusing on peace, human rights and regional development, which is evidence that we are headed in the right direction, even though we are aware that there is work still left to do,” added González. Momentos de la visita con diversos actores del sector minero en Europa. The interaction with different European actors will help keep the doors open to a demanding market, which wants to be well-informed on matters involving human rights and peace. In addition, it could prove useful in the future to generate alliances with other European companies that could contribute to resolving social problems in Drummond’s areas of influence through technology or knowledgesharing projects. “Drummond was also invited by the Dutch Ministry of Foreign Affairs to participate in the panel on ‘Mining for prosperity – Responsible mining in fragile areas panel to present our social responsibility initiatives focusing on peace, human rights, and regional development, which is evidence that we are headed in the right direction, even though we are aware that there is work still left to do,” Paulo González, Vice-President of Social Corporate Responsibility for Drummond Company, Inc.
En las reuniones se compartieron las buenas prácticas que Drummond lleva a cabo en toda Colombia. Reunión en la embajada de Colombia en Países Bajos. Working for a Better Country We know it’s important to report our activities and let people know about the impact of some of our Corporate Social Responsibility programs, so we’ve organized the following information on our performance in this area. THE ENVIRONMENT At Drummond we reuse water in internal processes in order to reduce consumption and our impact on the environment. The water taken from the ‘El Paujil’ reserve is replaced by rainwater gathered in the rainy season, thus avoiding the use of 455,341 cubic meters of water. TRAINING OUR TALENT The human rights training program teaches employees about our Corporate Human Rights Policy in three stages. Our machinery conversion program promotes adopting fuels that produce less pollution, especially natural gas vehicle fuels. The Forest Compensation Program conserves an area of approximately 25,000 hectares through reforestation and the recovery of ecosystems and natural resources. 231 workshops 78% TWO HOURS EACH. 40,098 CUBIC METERS OF WATER. OF CO2 INTO THE ATMOSPHERE. OF ADMINISTRATIVE PERSONNEL AND MANAGERS TRAINED. IMPROVING SCHOOLS This program facilitates children’s access to education through investments in school repairs and improvements. 598 people have benefited from the local work training and certification program that trains them in technical skills to open up more opportunities for them to work locally. The local purchasing strategy has created more than 100 direct jobs. In 2016, transactions with local providers totaled 4.3 million dollars. More than 2,500 people have benefited from the initiative to donate sports equipment and uniforms. More than 420 people (from 84 families) have benefited from the business unit implementation plan for rural families, through which they receive the training, technical assistance, materials and supplies they need to develop their own businesses. More than 100 students in the most vulnerable parts of our area of influence have benefited from the college scholarship program. In partnership with the Department for Social Prosperity (now Social Prosperity), we refurbished kitchens and restrooms and installed floors and roofs to improve the quality of life of more than 200 families. he ‘Well Done Mining’ campaign is an initiative promoted by the Colombian Mining Association (ACM, in Spanish) that aims to increase Colombians’ knowledge of the mining industry, applying high standards on economic, social and environmental issues. Drummond has participated in the development of this activity since its inception and has led the development of a closer relationship between the mining industry and society as a whole. “Without a doubt, Drummond has been one of the most active participants during the implementation of this campaign, not only because of the support it has provided for the different activities, but also because it is one of the best representatives of Well Done Mining in the country,” Santiago Ángel, President of the ACM. communication between the different actors in the mining sector and the communities, the local governments, opinion leaders and citizens in general. Of course, to achieve a change in attitude is not an easy task, but the most important thing is that we have already started to make progress and we are committed to continuing along that path,” said Santiago Ángel, President of the Colombian Mining Association (ACM, in Spanish). To a large extent, the negative stereotypes linked to this sector have come about as a result of the consequences of illegal or criminal mining, which does not meet minimum international standards and causes serious damage to the environment and civil society. “We are members of the ACM and have been part of the planning committees for various initiatives. One of these is ‘Well Done Mining,’ where we are working to recover the image that the industry deserves and counteract the bad reputation that has been created by those who practice criminal or illegal mining,” said Pablo Urrutia, Vice President of Communications and Public Relations at Drummond. THE CAMPAIGN HAS THREE MAIN COURSES OF ACTION: DIGITAL ACTION Includes the website www.mineriabienhecha.com that highlights the good social and environmental practices implemented by the companies participating in the campaign. This page is complemented with several accounts on social networks that help to spread information more quickly and reach a younger audience that consumes audiovisual content. “We have looked into strengthening our digital content, trying to reach more young people and develop other events that promote opportunities for interaction between the public at large and the main actors in the development of the Colombian mining sector,” Ángel added. A SYNERGY FOR WELL DONE MINING The partnership with the ACM has been beneficial for developing this initiative and has strengthened the organizations’ ties to promote a mining industry that respects the environment and the communities, and is committed to meeting international standards. José Miguel Linares, the President of Drummond, and also the Chairman of the Board of Directors of the ACM, has contributed to organizing the ‘Well Done Mining’ campaign. Thanks to his hard work, the company has maintained its leadership in strengthening the sustainability of the mining sector. (opinion leaders, communities, media, government) and the people who make up the Well Done Mining community. One of the most representative examples is ‘Helmets in the Plaza,’ an activity that took place on August 1 in the Plaza de Bolívar in Bogota. It brought together more than 500 miners from several mining countries around the country, who not only shared their experiences but also provided a sample of the cultural activities that take place in the regions. ENDOMARKETING Through this activity, the campaign seeks to celebrate pride in being a miner among the people who work in the industry, including employees, contractors, friends and family members. explored the importance of the mining industry for the development of the regions. As part of the ‘Helmets in the Plaza’ activity that took place in the capital and in other cities, Drummond participated with several employees and beneficiaries of its social and environmental programs who presented the public with the positive results of the formal mining that the company performs, complying with the current regulations. “Without a doubt, Drummond has been one of the most active participants during the implementation of this campaign, not only because of the support it has provided for the different activities, but also because it is one of the best representatives of Well Done Mining in the country. It has been an essential part of building the endomarketing campaign, very generously sharing the experience that they have acquired over more than 30 years of operation in Colombia,” Ángel concluded. very day the trains from Drummond and the other coal companies, with lines of cars more than two kilometers long, travel with 7,500 tons of coal to and from the ports in Ciénaga (Magdalena). To monitor this task properly and ensure the safety of this logistical process, Drummond, in association with other coal companies and through Fenoco, invested in a new Train Control System with innovative technological components known as the ITCS, Incremental Train Control System. Thanks to this investment, the system ensures the proper functioning of the operation and its compliance with safety protocols. By doing so, the company has set up an intelligent performance solution that makes the transportation system even more efficient, while also protecting users and operators. exceeding the speed limits established for the operation, in order to avoid train collisions, derailments due to excess speed or train movements through switches on the main line that are not properly aligned. “Behind the railroads there are many people working to maintain the tracks, maintain the equipment, man the trains, position the tracks, give instructions for moving the trains and many other tasks. A human error, however minor, can trigger an accident with major consequences and this system efficiently reduces those risks,” says Javier Gómez, Superintendent of Railroad Operations. With the new system, everything is centralized through the Rail Traffic Control Center. The movements made from there are translated in real time into instructions on a screen in the locomotive that the engineer must follow exactly. “If for any reason any crew member ignores the instructions, the system takes control of the train and stops it safely so the preset limits are not violated,” adds Gómez, who has been working on Drummond’s rail line for more than 12 years. Every 24 hours, we move an average of 28 trains. Each train has 3 locomotives, 150 rail cars and a length of more than two kilometers. 100,000 tons of coal per day (a tractor trailer could only move 40 tons per trip). In 10 days more than one million tons of coal are transported. Three locomotives can move – with low pollution, much greater efficiency and lower fuel consumption – the same amount of coal that could be transported by 190 tractor trailers. LEVELS OF SAFETY IN THE OPERATIONS In the world of railroads there are several levels of safety. The most basic is called “Dark Territory.” At this level, the operations are handled through radio blocking. The locomotive operator communicates with a station, which in turn contacts the nearest stations and a control center and executes the track order so that the train can travel from one point to another. Several actors participate in this process of executing instructions, and there can be communication errors or omissions, so it is a level that is highly dependent on the state of concentration and compliance with the rules by the people participating in the process. The next level is a Centralized Control System: Centralized Train Control – CTC. This system uses traffic lights to control the passage of trains, and it is the system under which most of the world’s trains operate. The tracks have cables and circuits connected to booths that, in turn, are connected to a Control Center, and from there the traffic lights and switches located along the railroad tracks are controlled, and thanks to this system the train obtains visual information so the crew knows when to stop or move on. In a CTC system, the Control Center can make changes to the trains’ initially established routes if there is an emergency or an unexpected event. This system is much more technologically advanced than the previous system. However, it is highly dependent on the trains’ compliance with the rules and adherence to the signals; that is, if a train ignores a traffic light or exceeds an authorized limit or goes faster than allowed, there is a high risk of an accident occurring. The last level of railway safety is the one currently implemented on the line held in concession by Fenoco, to which Drummond actively contributed along with other railroad users in northern Colombia. There are no traffic signals on the tracks and no circuits to identify the trains, but rather the trains are equipped with powerful computers that connect the vital parts of the equipment. In turn, these are connected to a communication network that makes it possible to connect the trains to each other with virtual signals along the track, and GPS satellite communication to the devices on the track and to the Control Center in Santa Marta, exchanging large amounts of real-time information received by large computing stations that are centralized under the command of a single Rail Traffic Controller per subdivision. All of this means that the instructions that the Control Center issues are highly reliable and are received in real time both in the cabins of the trains and the devices on the track, providing a very high level of safety for the trains’ movements. If for any reason a train goes faster than allowed, tries to pass an unauthorized point, stops where it should not, does not follow the instructions that appear on the on-board computer, or tries to move along an unauthorized route, the system takes control of the train and safely stops all trains around it to avoid accidents. By doing so, it ensures that even if there are human errors, communication errors or the Control Center’s instructions are not followed, the safety of the crew members and the people working on the railroad lines will always take precedence. RELIABLE TRIP One of the benefits of the new system is that it ensures the ‘reliability of the train,’ that is, it keeps the train’s protection and braking systems complete through constant communication between the head and the tail of the train and the On-Board Computer (OBC), in a way that guarantees the crew that the train is traveling as a whole even though they cannot see the tail. The length of these trains exceeds 2 kilometers. Additionally, the system constantly monitors the air pressure in the brake pipe and in the tail of the train, informing the engineer how much air is available for better management during braking. At the same time, the system installed on each train maintains constant communication between the trains that are traveling on the tracks and it sends information to the Control Center, including its georeferenced coordinates via GPS, to precisely monitor the location of the cargo, transit times and speed, among other data. Under normal conditions, 14 Drummond trains move in each direction: completing daily cycles between the Mine – Port Terminals, 14 are coming and 14 are going within 24 hours, so that an average of 28 trains move per day. There are 18 coal trains owned by other companies that also use this railway line. Generally speaking, the total investment for this system to be used throughout the railroad complex (which is used by Drummond and two other companies in the sector), exceeded 60 million dollars. “Drummond’s trains are loaded at the company’s mines located in La Loma, Cesar [the mines are located near this town] and travel along the railroad corridor to be unloaded at Puerto Drummond, located in the municipality of Ciénaga, Magdalena, on the Caribbean coast. The other users’ trains, which have also added this ITCS technology, unload at Puerto Nuevo and Puerto Córdoba, also located within the jurisdiction of the municipality of Ciénaga, Magdalena,” adds Gómez. GE Transportation, now owned by ALSTOM, a French company focused on train manufacturing and the world’s largest provider of train signaling systems. This technological development was created taking into account the most demanding international standards related to safety and efficiency, which is why Drummond’s operations are currently at the top levels of railway safety. STATUS OF THE PROJECT Although the implementation stage is already complete, the learning curve continues, especially in some functions that must be adapted to the systems that were already established. Significant training efforts have also been needed to take full advantage of the potential of this new technology and facilitate the handling of this innovation by the Drummond team. “The crew members that previously operated based only on radio transactions have worked hard to learn a lot of information with new Rail Operations Regulations, ROFF in Spanish, new manuals for the ITCS system, new procedures and how to use the OnBoard Computer to follow instructions; this learning process was completed in the record time of two years and they are constantly learning through newsletters and updates. Most of Drummond’s crew are people from the area of influence of our project that have shown great professionalism and adaptability to the new technologies that add to the great experience of performing their jobs, combining knowledge of diesel mechanics, tires, electricity and electronics, among others,” says Gómez. The basis for training the crew members on the new system is found in the ROFF Regulations. Their way of operating changed drastically as compared to the previous system, which has strengthened their skills to the extent that all of the benefits of the new system were implemented continuously. Javier Gómez, Superintendent of Railroad Operations. A COMPLETE TRAINING PROCESS However, for a person to become a Drummond engineer and manage the ITCS system, given the transportation regulations for locomotives, they must go through a complex process. “In Colombia it is not easy to find locomotive engineers; there are no training institutes or educational centers that consistently include training in this field. This is why we have been working on a partnership with the SENA so that we can ensure that we are training people who are qualified and certified for transporting our cargo by rail,” Gómez adds. Drummond hires students (who receive pay during the time they are studying), and in coordination with the SENA it has designed a curriculum for their training that has a theoretical stage and a practical stage. Once they complete their studies and graduate, the best students join Drummond to work as engineers’ assistants at Drummond and begin their careers with the company. “Every year we publish a call for participants in locomotive engineer training for 15 to 20 students. Today we have six classes that have graduated plus a seventh that is currently in the training stage, from which there are now crew members that are moving trains and are part of Drummond’s railway operation staff,” he adds. Another important group of people are the employees of Fenoco as the concession holder of the main railway line, who are responsible for the control center and perform maintenance on the signaling system and conduct the trainings on the Regulations and issue the rules and updates for operating the system. Generally speaking, the total investment for this system to be used throughout the railroad complex (which is used by Drummond and two other companies in the sector), exceeded 60 million dollars. One of the benefits of the new system is that it ensures the ‘integrity of the trip,’ that is, it protects the integrity of the cargo carried by the train, so that the rail cars do not separate or lose part of the coal cargo. “It is worth highlighting the enormous ability and great response that people have to learn and grow when they are given confidence and an opportunity. In our area of influence, both in Cesar and in Magdalena, the young people in these communities are the core of our training process, and it is precisely this social group that Drummond has given the opportunity to complete their studies. Seeing how they become professionals thanks to their hard work in the training cycles is a great change that brings us a lot of satisfaction. In addition to obtaining a degree upon graduation, and having the first chance to be hired by Drummond, they can work at any other railroad line in the world that has this technology. They are people with a high level of training in their work,” Gómez concludes. Ron Damron, Vicepresidente de Operaciones en Colombia, se dirige a los empleados en reunión celebrada en la mina Pribbenow en La Loma, Cesar. and there is no place for second guessing or misinformation regarding the company’s actions, which is an advantage,” says Pablo Urrutia, Vice President of Communications and Public Relations for Drummond. In timeframes that range from 30 to 40 minutes, the company’s employees can receive reliable and accurate information about the state of the company, directly from top management. 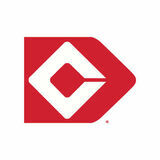 This contact has strengthened labor relations at Drummond and has served to reinforce the company’s social fabric. “Employees present concerns on various issues, the questions are always varied and may include topics on the operations, industrial safety or other aspects related to their duties and wellbeing at the company. This has been a very positive exercise, especially in terms of direct communication,” says Claudia Acosta, Director of Recruitment and Development at Drummond. “All employees, starting at the operational level, receive first-hand information from those who handle the most important issues, and there is no place for second guessing or misinformation regarding the company’s actions, which is an advantage,” says Pablo Urrutia, Vice President of Communications and Public Relations for Drummond. 80% of administrative and management personnel has already received human rights training. In the ‘Train the trainers’ program, 110 leaders received training to be replicated through training sessions with all technical and operational personnel in the regular training cycles. So far, more than 1,300 employees from the mines and the port have attended. THE STRATEGY HAS BEEN EXECUTED IN THREE DIFFERENT TIMEFRAMES: The company’s top management (CEO, CFO, etc.) participated in a human rights training cycle that took place in 19 sessions and through different methodologies that included practical work; they identified the main risks for the company in this area, as well as the opportunities to manage them properly. This information was then shared with hourly employees, supervisors, and administrative roles. Nearly 900 people at the mines, in the port, in Valledupar and in Bogota received training on human rights issues and contributed to defining the risk management policies associated with this topic. A similar exercise was carried out with the unions and salaried employees through the regular training cycles. “Employees are surprised at how open the company is to receiving feedback on this topic. We have received a very positive response from all levels. They feel they are being heard and know they can support the company’s work,” says Rafael Unda, General Manager of Ardura S.A.S. with extensive experience in human rights topics. FIRST ANNIVERSARY OF THE DEATH OF MR. GARRY NEIL DRUMMOND, PRESIDENT AND EXECUTIVE DIRECTOR OF DRUMMOND COMPANY, INC. Garry Neil Drummond passed away at 78 years of age in Birmingham, Alabama, accompanied by his family and loved ones, with whom he shared his life until the last minute. He was a natural leader and committed to his work, and for that reason was able to position Colombia as one of the world’s main coal producing companies, and Drummond as a company with a desire to grow and to achieve great success together with its employees. In commemoration of one year since his death, last July 13 and 14 various events were held in the company’s different offices in La Loma and in Valledupar. They included a ceremony to reveal a commemorative plaque giving the name of Garry Neil Drummond to the main street of La Loma, a religious ceremony at the church in La Loma, Cesar, an invitation from the Mayor of El Paso, Hidalfo de la Cruz, a day of reading and coloring in the Garry Neil Drummond Children’s room in Valledupar, and a concert by the Rafael Orozco Symphony of Becerril in the Rafael Carrillo Luquez Library. EXCELLENT HIGH SCHOOL STUDENTS RECEIVE DRUMMOND SCHOLARSHIPS Thirteen high school students from the Departments of Cesar and Magdalena have benefited from the college scholarship program offered by Drummond, with full payment of tuition in the area of study of their choice and a subsidy for food and lodging. The scholarship winners had an opportunity to receive the official documents accrediting their scholarships in the company of their families, and hear a pleasant message from the President of Drummond Ltd. Colombia, José Miguel Linares. The event took place in the city of Santa Marta at Hotel Santamar, and in the city of Valledupar at Hotel Sicarare, on February 2 and 3. Drummond is proud to contribute to the professional development of young people from its area of influence as a way of generating development and progress for the country through education. “Be a Star Player against Waste” is a campaign under the company’s social responsibility program with the Compass Group. Under the program, the company has a commitment to deliver food to seniors at the Sagrado Corazón de Jesús Retirement Facility, in Ciénaga, Magdalena. Food delivery takes place at Drummond’s port installations, with a total of 75 kilos having been received by the senior citizens. The company has made a strong commitment to encourage employees, through this campaign, to eat only what they need and not throw food away, because the seniors need it. DRUMMOND RELEASES FAUNA IN PROTECTED ZONES OF ITS CONCESSION ON WORLD WILDLIFE DAY In commemoration of World Wildlife Day, Drummond Ltd. released ten red-footed tortoises, two spectacled caimans, and one boa constrictor that were under the care of Corpocesar and the George Dahl Foundation. The release took place at the installations of the Pribbenow mine in protected zones near Nolisa Creek, a tributary of the El Paujil channel. This is one way the company makes tangible its commitment to the protection of the environment and natural resources. Preserving life in its natural surroundings is an essential task for ensuring the sustainability of ecosystems and the development of biodiversity. In addition, Drummond Ltd. organizes regular campaigns to train its workers about the importance of conserving plants and wildlife, thus demonstrating its commitment to the preservation of the ecosystems intervened. The second phase was signed in Bogota of the home improvement agreement between UNOPS from the UNDP and the Social Prosperity Department (DPS for the Spanish). This is a continuation of the project signed in Valledupar between Drummond Ltd. and the DPS. The main objective of the program is to make interventions to remodel and transform the homes of those most vulnerable in order to diminish extreme poverty through this means, promoting healthy habits for each of the beneficiary families. In total, 200 homes in La Aurora, Cerrajones, La Loma, Casacara, and Cienaga will benefit from Drummond’s contribution, bearing in mind the importance of strengthening and cooperating in the sustainable development of the region and of the company’s areas of influence through support networks bringing together the public and private sectors. PEACE-BUILDING STARTS WITH A GOOD EDUCATION On March 17, Drummond Ltd., in conjunction with the Mayor of Ciénaga and other institutions, led in the delivery of four new works in favor of education for young people in the community of Ciénaga. All of these works, developed in the framework of the company’s social responsibility, promote the creation of venues that will contribute to children’s education with an eye toward building a better society. This alliance between Drummond Ltd., Fundepalma, and the Municipal Mayor will facilitate healthy use of free time by giving children quality play areas that will contribute to their comprehensive development, thus bringing up young people who have a future full of peace and integration with society. istening to the song Madrigal, I remembered that in September 2017 we moved 57,480 trains. In the next few days, train number 11,422 will arrive from the El Descanso mine, but not before making a trip through the department of Cesar, passing through Fundación, where surely in the distance songs like Lucero espiritual and Misterioso pájaro carpintero will be heard. as a child, I would still get sad because I never got my electric train for Christmas, even though that sadness faded quickly as I enjoyed my other new toys. The following Christmas, I got emotional with my father as he said to me: I am going to give you two gifts that you are going to like very much. And that was true. He gave me a wooden car, which he had made himself, one for me and one for my brother. The other gift was a poster with the men who had gone to the moon. He knew how much of an impact the news of Neil Armstrong, Buzz Aldrin, and Michael Collins getting to the moon in July 1969 had had on me. had been applying the law of attraction. My children listened very carefully. A few days went by, or maybe months, and I mentioned the safety talks to them again. Richard, my youngest son, said to me: “Dad, you’re really annoying with all that safety talk.” As if safety was a science! This stayed with me for a long time. I don´t know if industrial safety is a science, but I am sure that it is a blessing from God, since the first signs of concern for the welfare of employees in the workplace date back to 400 B.C., when Hippocrates, known as the father of medicine, made the first observations related to occupational illnesses during the European Industrial Revolution [sic]. Since then, great importance has been given to industrial safety. Here at Puerto Drummond, the most important things are wellbeing, health, the environment, industrial hygiene, and occupational health, but above all comes employee harmony with EFFECTIVENESS, SAFETY AND COMMITMENT. B eing safe and preventive orking as a team W M aintaining unity with leadership and T aking risks responsibly and H aving an influence with enthusiasm and G iving the best of oneself though the A rt of listening with D edication to human beings Safety is like work. It gives us dignity as human beings, makes us capable and useful for our families and society in general, and makes the world a better and more peaceful place.